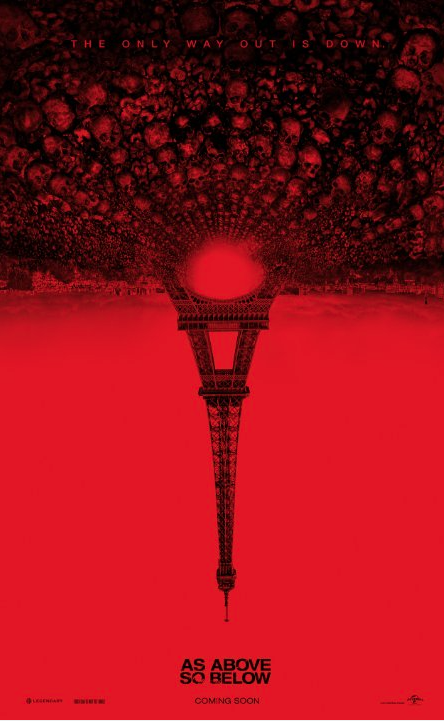 As Above, So Below, let’s be clear, isn’t a particularly good movie, but it is a damned entertaining one. The story, such as it is, revolves around Scarlett (Perdida Weeks), who’s searching for the clues that would lead her to the Philosopher’s Stone, which I should mention that her father was also searching for, before he hung himself. Bad omens aside, Scarlett is accustomed to going where saner heads refuse to tread, so she charges on and eventually makes her way to Paris, where a vital clue to her quest awaits. As Above, So Below is also a found footage movie, despite the film not being found by anyone (which is a little odd, when you think about it). John Erick Dawdle also directed Devil and Quarantine, and while those are both better films, they’re not nearly as frenetic or fun. Though what’s curious about the film is thatthere’s a campiness, a silliness to As Above, So Below that I am not sure is not was deliberate. For instance, there’s a scene that I call the ‘creepy woman inside the club’ scene, that is so silly–and I mean laugh out loud silly–that I couldn’t imagine what was going through Dawdle’s mind when he filmed it. There’s even a later scene–when Scarlett and her gang are exploring the Catacombs of Paris–that is almost as silly (you’ll know it when you see, or hear, it). The first scene I can see as a mistake that just slipped by the director. The second…I wasn’t sure what’s going on. Maybe he’s channelling his inner Joel Schumacher or something (in the sense of camp because Schumacher never did anything so odd by accident). So As Above, So Below when all is said and done, in terms of the total package, is a bit lacking. That being said, it’s fun, and besides–you probably already seen Guardians of the Galaxy (twice)–it’s worth checking out. And if anyone could stomach the Transformers (Any of them. Take your pick), this’ll be walk in the park. Or maybe a climb in the cave. Posted in directors, horror, Legendary, Movies, review, Universal.Tagged Devil, guardians of the galaxy, Joel Schumacher, John Erick Dawdle, Perdida Weeks, Quarantine, Transformers.